A high school football drama, Friday Night Lights is an intense study of sports-as-life, with a small rural community living vicariously through its football team. It's the start of the 1988 high school year, and the small town of Odessa, Texas fully expects their Permian High School to win the football state championship. 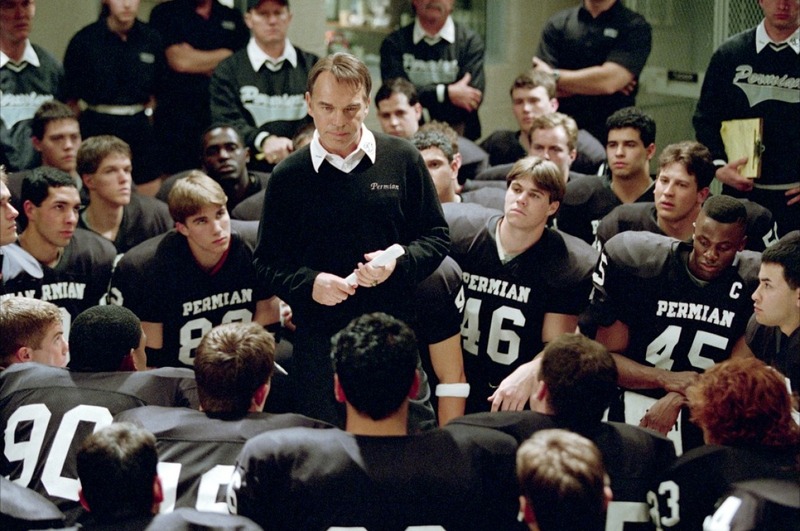 Coach Gary Gaines (Billy Bob Thornton) is highly respected and highly paid, but has to deliver or face the wrath of the community. The team of seniors is talented but small in size. Running back James "Boobie" Miles (Derek Luke) is the star player and already inundated with college scholarship offers. 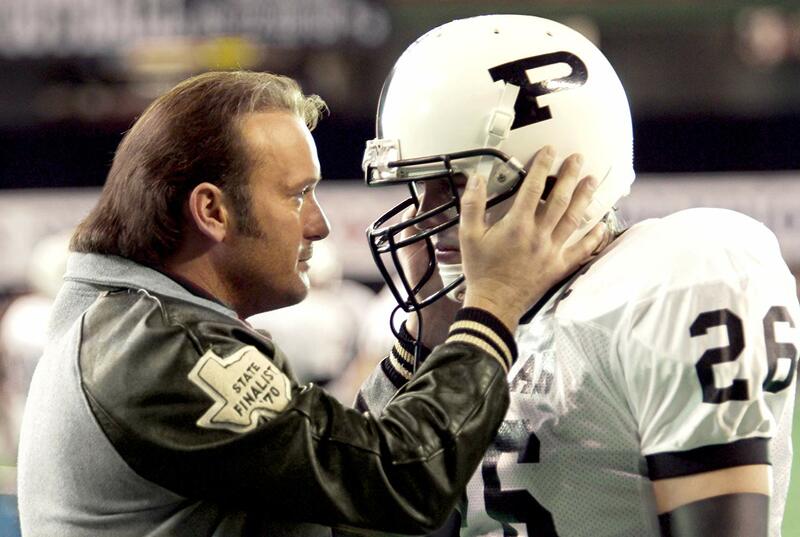 Quarterback Mike Winchell (Lucas Black) is effective but moody with an ailing mother and no support at home. Fullback Don Billingsley (Garrett Hedlund) has a tendency to drop the ball at crucial moments and is constantly berated by his father Charles (Tim McGraw). The other players include third-choice running back Chris Comer (Lee Thompson Young), safety Brian Chavez (Jay Hernandez) and linebacker Ivory Christian (Lee Jackson III). The season starts with a victory but also a serious injury. Permian has to regroup and recover, and they stutter their way through an unconvincing regular season, raising doubts as to whether they will even make the state championship playoffs. Gaines and the seventeen year old boys find themselves under increasing pressure to succeed. Directed by Peter Berg and based on the non-fiction book by H. G. Bissinger, Friday Night Lights delves into small-town Americana through the lens of high school football. High and lows, hopes and disappointments, spectacular triumphs and bitter defeats, Odessa lives and breathes through the fortunes of the Permian football team. And it's the American way that only winning matters, expectations are immense, and it does not matter that the shoulders of seventeen year old boys may not be broad enough to carry the full weight of a town's dreams. The film spans the season from August to December, and spends most of its time in the dressing rooms, on the training pitch, and on the playing fields. Scenes that take place away from the football facilities address one thing and one thing only: football talk. Friday Night Lights appears oblivious to anything else happening in the community, and this is the point: not much else is happening in the community. For the senior players football is their ticket out of town, and for their parents, football is their one escape from lives that came to a halt after high school. The glimpses into private lives are poignant and forlorn. Full Don Billingsley's father Charley is either drunk, violent or both, incessantly berating his error-prone son for not being good enough. Country music singer Tim McGraw captures a pathetic man fully aware that his singular moment of glory came at seventeen. A cloud hangs over quarterback Mike Winchell's house, his father absent and his mother ailing. The team's cocky star Boobie Miles appears to have no parents but his loving uncle L.V. Miles (Grover Coulsen) is guiding his career towards the riches of top scholarships until fate intervenes. Coach Gaines is the calm eye of the storm, an outsider to the community and therefore there for one reason: deliver the championship. Used to the pressure, Gaines knows to push the right buttons at the right time to get the most from his team, and off the pitch calmly tolerates everyone lecturing him on how to do his job. But at home, conversations with his wife Sharon (Connie Britton) revolve around the next career stop. After the pressure cauldron of football-mad Texas, Alaska is sounding good. The in-game scenes are plentiful and rarely less than thrilling, Berg capturing momentum shifts, game changing plays, touchline frustrations and moments of individual tragedy and heroism. Friday Night Lights is all about executing the plan, chasing the dream, overcoming the pain and reaching for glory, life played out between the lines of the football field.